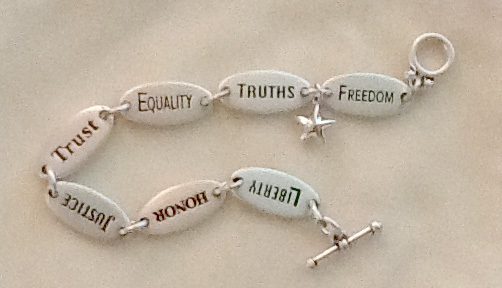 Home > "America's Freedom Bracelet" > "America's Freedom Bracelet"
Select ... Regular 7.5" Medium 8" Extra Large 9"
Reversible bracelet inspired by America's founding values. On one side are the standards of democracy: Liberty, Honor, Justice, Trust, Equality, the Truths we hold self-evident, and the principles of Freedom. 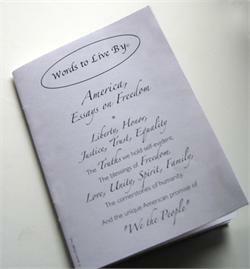 A celebration of country, family, faith and the liberty of life. Each bracelet comes with the inspirational booklet, Words to Live By™, "Essays on Freedom" filled with a collection of thoughts from America's patriots, presidents, poets and others to remind, inform and inspire. Beautifully packaged in a velvety jeweler's wrap, ready for gift-giving, with all of the award-winning features that make our products treasures to give or receive. A very meaningful message for all of America's patriots and a special tribute to our veterans and those who defend our freedoms. New! Add a small sterling silver puff star to your purchase and we will attach it as shown in the photos. A great way to celebrate this meaningful message. Select the customized version. This was given to me as a gift, and I love everything it stands for!!! 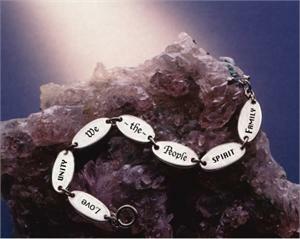 I have been in the army six years and will be purchasing some for fellow soldiers...very beautiful piece, and meaning.